2018 has been the year of the crypto bears. After seeing all-time-highs towards the end of 2017, most crypto investors have spent a large part of 2018 looking at their portfolios closely, biting their nails and pulling out their hair. The slump just doesn’t seem to end! Some traders have turned the bear market to their advantage as well, selling the highs and buying back the lows. Whichever group you belong to, you need a portfolio tracker that is both accurate and prompt. Excel sheets won’t just cut it when you have good money invested in crypto. There are hundreds of trackers out there giving us multiple choices for a singular objective. Having a good portfolio management system is crucial for making judicious investment decisions. However, trying out all the available apps and software to find the most suitable is not a practical solution. Like its name suggests, Gem has turned out to be a gem among all the portfolio trackers we have explored so far. Gem has the best user experience and is the easiest to use in this list. It is quite straightforward to get started with. The aesthetic design elements are pleasing to the eye. Gem is app-heavy with a light web presence i.e. only the Discovery section is accessible from web (more on that later). Gem allows exchange sync functionality. So no need to manually enter trades anymore. Moreover, you can create a Gem account, thereby allowing portfolios to be ported. 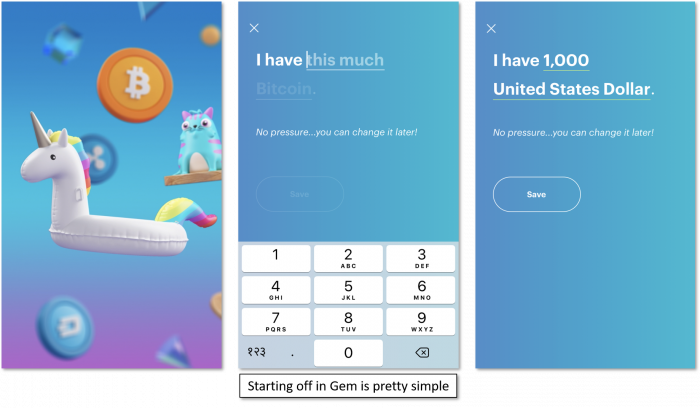 Gem is completely free-to-use and there are no hidden conditions or paid plans. Most portfolio trackers don’t have the ability to import/retain portfolio especially when people lose or replace their handheld devices. With Gem, you can create an account, and the portfolio created on Gem gets linked to the account. So the next time your phone gets replaced, simply log in to your Gem account from your new phone and your portfolio will be there as it was. Gem supports all known cryptocurrencies and fiat. It also supports exchange sync with 25 top crypto exchanges with more to come. Simply link your API key with Gem, and all trading history on your exchange account gets synced to your Gem account automatically. This eliminates all need to add trades manually. There's also a Discovery section on Gem which acts like a price tracker and personal crypto research corner. You can mark favorites, read whitepapers, check out short blurbs and find top gainers and losers in the market from the Discovery section. This is the only section of Gem that can be viewed from a web browser as well (https://discovery.gem.co/). Upcoming updates in Gem include adding a wallet (in 2019) with Shapeshift integration. Suffice to say that the wallet will auto sync with Gem portfolio. Moreover, Gem will connect to services like Shapeshift (and others) to enable trading from Gem itself. Some more minor updates scheduled in the roadmap are price alerts, trade history export (for tax purposes), widget for iOS. The full range of features on Gem is free; there are no paid plans. 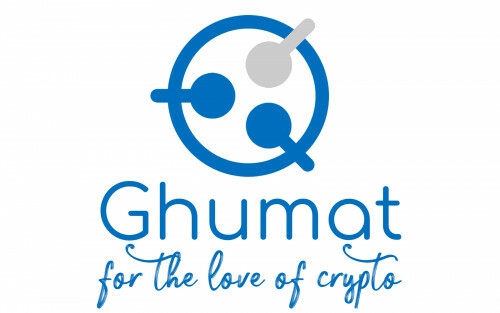 Moreover, Gem has been around since November 2013 and as per its Crunchbase page (https://www.crunchbase.com/organization/gem), Gem has raised USD 20M+ from investors that include veteran investment firms such as Fenbushi Capital and Blockchain Capital. So Gem means serious business in this space. Our Take: From the roadmap, the overarching vision towards developing Gem seems to be to make it a portfolio tracker, wallet and trading exchange all combined into one product. Basically, make it a one-stop shop for all things crypto. It is the most visually striking and simple to use tracker at the moment. Gem is feature-rich (portfolio import, exchange sync, Discovery etc.) and free to use. The only thing that seemed lacking was the ability to add multiple portfolios. Having said that, this feature is included in the roadmap. Gem is best suited for crypto beginners and intermediates. Features coming up in 2019 will find many takers in full-time and advanced crypto traders as well. Blockfolio is one of the most popular portfolio trackers out there and for good reason. It has 5M+ downloads and 90k+ reviews in Google Play Store and Apple App Store combined. Intuitive design is the cornerstone of the app. Blockfolio is focused entirely on the app with no web-available feature. It allows for tracking of multiple portfolios and like Gem, Blockfolio is free-to-use for all its features. However, there is no exchange sync capability which means all trades have to be added manually. 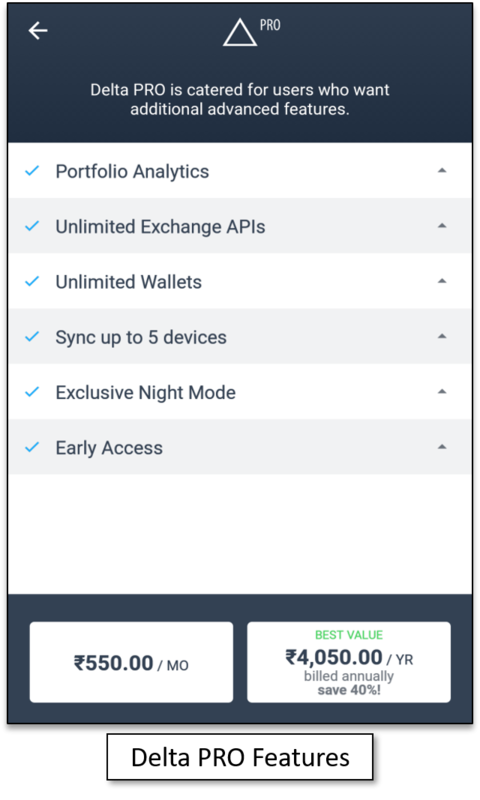 A useful feature in Blockfolio is the ability to add multiple portfolios thereby allowing you to classify your investments into different categories and tracking them independently. However, since there is no exchange API sync capability, all trades must be added manually. Blockfolio lets you import your portfolio(s) in case your handheld device gets replaced or stolen. To do this, you must backup your Account Token ID (saved under “Data Recovery & Transfer” in Settings) and send an email to support@blockfolio.com. As per their mid to long-term road map, Blockfolio will additionally allow for creation of an account login for users who wish to access advanced features like backup and sync between devices. One of the most popular features of Blockfolio, Blockfolio Signal, lets projects send notifications and alerts directly to the Blockfolio App with technical developments, partnership news and other updates. This, combined with the Explore section on the app that lists the latest news on crypto, provides a good space to stay updated. You can also customize the Explore section to choose which news sources to list the news from. Additionally, Blockfolio allows for ‘Night Mode’ in the app which is a nice-to-have feature. There’s also an option to set up a secret PIN to prevent other people who are using your phone from snooping into your Blockfolio data. Blockfolio was co-founded in 2014 by Edward Moncada who is a Dash Foundation Board Member. Blockfolio supports more than 6,000 cryptocurrencies and 250+ exchanges. In October 2018, it raised USD 11.5M in its third round of fundraising led by Pantera Capital. Blockfolio has so far raised USD 15M from seasoned players that include Refactor Capital, Huobi and BitMEX among others. Blockfolio has used this time and money towards steady development over the years and keeping the app free of any charges. With regards to future revenue plans, Edward Moncada gave a direction in reply to a Medium comment in November 2018: "We eventually plan to monetize the app. Most likely it will be through an ad platform built around Blockfolio Signal...."
Our Take: If you're looking for a simple and free portfolio tracker, Blockfolio is for you. Full-time traders will find some features lacking in Blockfolio, especially the lack of import options. Adding all trades manually is a sore point. Though Blockfolio doesn't have too many features, there are some that make it stand apart. 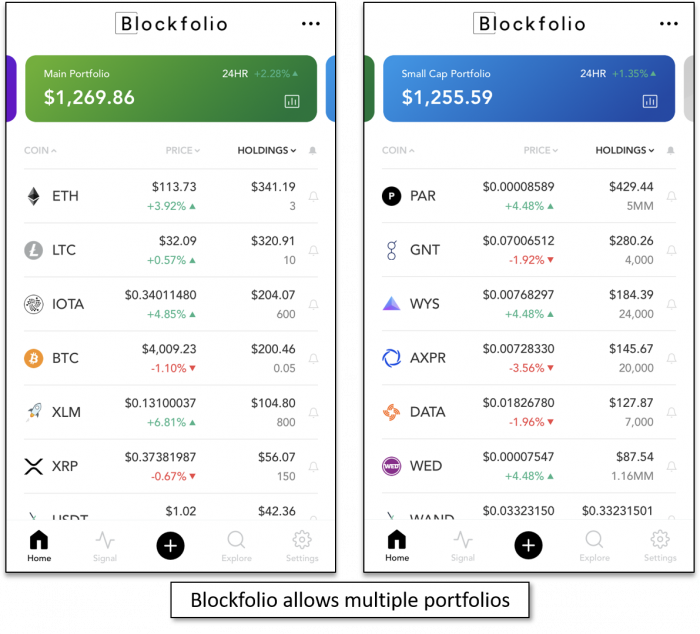 Ability to add multiple portfolios, direct news updates from developers (Blockfolio Signal) and being completely free are some reasons behind Blockfolio's ongoing popularity. 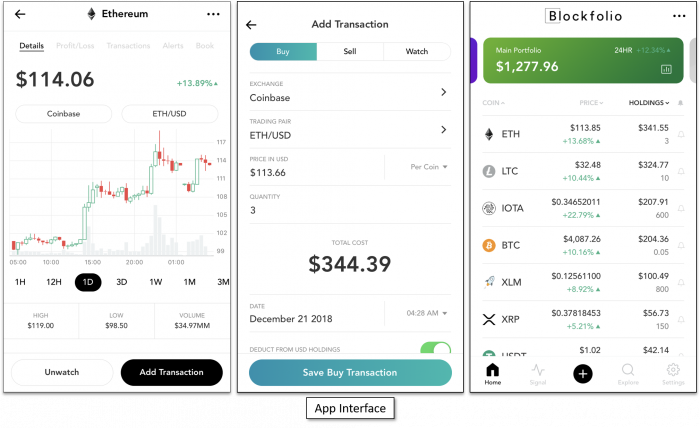 CoinTracking is a portfolio tracking app that offers a host of features and is aimed at the more serious cryptocurrency investors and full-time traders who want something more than just a spreadsheet displaying their portfolio. The CoinTracking app is available for both Android and iOS, but registration has to be done on their website first. Moreover, all trades have to be entered through their website which, frankly, is a little annoying. The app simply redirects you back to their website when you try to enter any trade through it. It seems like the mobile apps are meant to function more like accessories complementing the web product. The interface is a little dated but non-gimmicky. You can import all your trades from major exchanges simply by importing the .csv files with trade details. CoinTracking also allows interaction with major exchanges using API keys to import the latest portfolio and trading data. There’s also an option to import data from hardware wallets like Trezor and software wallets like Exodus or Blockchain.info. The full range of fancy features, however, is available only for customers who are willing to pay for the services. The free account lets you enter only upto 200 trades, and doesn’t let you import data from any blockchain wallet. If you wish to upgrade, you have to go for either the Pro or Unlimited plans. This will cost you anywhere from $65 to $1090 (or an equivalent amount in BTC) depending on the plan and the time frame. CoinTracking also lets you check the historical price data of all major coins and tokens in currencies of your choice. 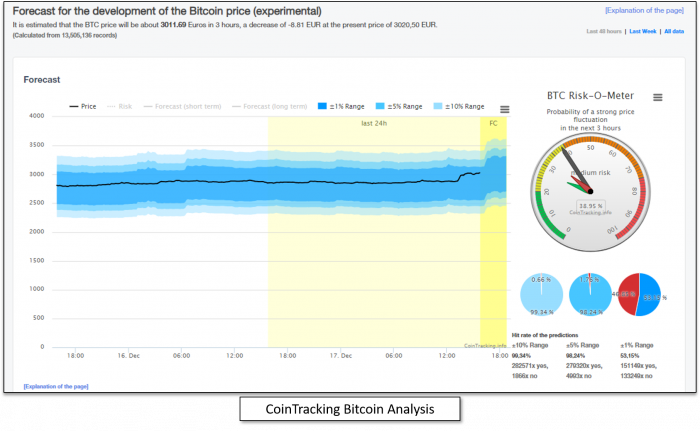 There’s also an experimental Bitcoin Analysis section, which predicts the price action of BTC based on past trends. We found this section to be quite interesting, although we are yet to find out how accurate their price predictions really are. There’s also a Tax Computation tool, which is available for most countries as per their help page. Here, you can create tax reports, generate profit/loss sheets, and even find out which coins can be sold free of tax at a given date. The free version of CoinTracking is limited to only 100 trades though, and you’ll have to upgrade if you wish to go beyond this. Our Take: CoinTracking is a portfolio tracking and analysis tool for people who are deep into crypto trading and investments, and are willing to pay for premium services. It can bring a lot of value to active traders, especially to those with a large and varied portfolio. The Tax Computation tool comes handy for serious traders in geographies that have crypto tax regulations in place. However, if you are looking for just the free version of CoinTracking, then there are other products with better value propositions in the marketplace. CryptoCompare is an entire ecosystem built for crypto. For example, there’s a section which describes and compares different cryptocurrency wallets, and one which provides information about mining of cryptocurrencies. There is also a news section keeping users up-to-date about all major occurrences in the crypto world. The portfolio management tool is just one of the many components of this ecosystem. The CryptoCompare UI is no-frills and a little old-timey. Users can create an account and add multiple portfolios to it. Data added to the account is stored in the cloud. So you don’t end up losing your data even if your phone goes missing. There’s also the option to make your portfolio public for others to see. The Android and iOS apps are curtailed but handy extensions of what you get on the website. Once you have entered coins and their purchase price, CryptoCompare calculates data such as realized profit or loss, total revenue, and your pending taxes (through a fairly basic tax calculator). There’s also a Risk Analyzer, which analyses price action of your holdings and provides you with insights, such as how volatile the portfolio is or how easy it is to liquidate the assets. Simple documentation is provided explaining all the available features. In addition to the analysis tools, there are some fun features as well. Such as a list of public portfolios available for general viewing, and an ICO tracker which tracks some of the popular ICOs from their date of inception. There’s also a live feed from top exchanges which shows you how the listed tokens have been performing. Another simple but interesting feature of Cryptocompare is that it tells you how much of your crypto is held in exchanges and how much in wallets. A constant (and necessary) warning to people relying solely on exchanges to store their assets, if you ask us. One big disadvantage of CryptoCompare is that there is no exchange API sync capability to import trades from exchanges directly. All trades need to be added manually, which is a pain point for active portfolio holders. 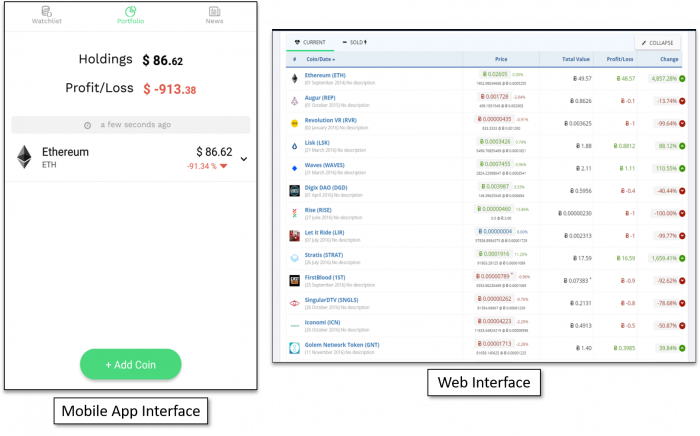 Our Take: CryptoCompare is web-heavy with the app having limited features. It is focused on being a one-stop solution for all crypto needs, but it’s still not quite there. As already mentioned, the absence of an option to import portfolio directly from exchanges is a downer. On the other hand, the ability to add multiple portfolios, risk analysis charts, news and ICO tracker sections are some of its brighter points. 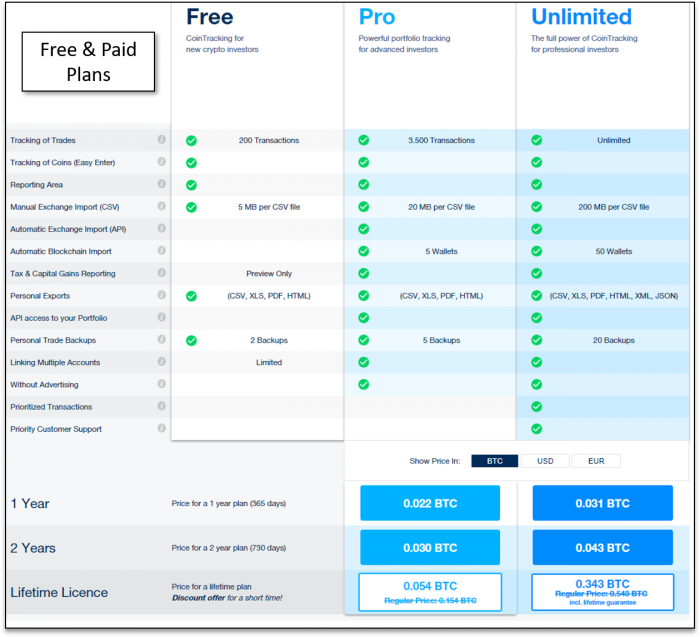 Completely free for personal use (there are some commercial paid plans for using CryptoCompare API calls), this is a nifty little tool for new and infrequent users. But advanced users will find it lacking both in features and the UX. Like Blockfolio, Delta is one of the most popular crypto-tracking apps with 1M+ app installs. It is predominantly a mobile app, supporting both Android and iOS. There are also desktop clients for Windows, Mac and Linux. The desktop clients are essentially extensions of the mobile apps as you have to sync the desktop apps with your mobile apps before you can start using them. The interface of Delta has a minimalistic and corporate look and feel. Apart from the usual portfolio tracking feature, you can also set up a Watchlist to track coins which you are looking to buy into. You can use API keys to connect to exchange accounts (7 exchanges supported right now) and sync with your crypto wallets to seamlessly import all your trades and holdings in one place. Another useful feature is the Account Recovery option. The app generates a dynamic recovery code, which can be used later to restore the app to the last known state. Delta also comes with free and paid plans. Delta PRO is available at USD 7 (for iOS users) and USD 8.5 (for Android users) per month and USD 60 (iOS) and USD 70 (Android) for a year’s subscription. Delta PRO offers advanced Portfolio Analysis tools. While the free plan allows you to connect with only 2 exchange accounts and/or wallets, with Delta PRO you can connect with as many exchange accounts and crypto wallets as you want. Delta PRO is currently priced at ‘Early Backer’ levels, which essentially means that if you subscribe now, then you keep on paying the same subscription fees forever even if they decide to increase their rates in the future. The Delta community is quite active on social media platforms like Telegram and Slack. Delta supports 3000+ cryptocurrencies and 200+ exchanges along with the ability to add custom coins for ICOs that haven’t listed on an exchange yet. Similar to Blockfolio Signal, Delta has the Delta Direct feature. Delta Direct allows crypto projects to send direct information to the Delta app thereby allowing teams to communicate directly with their end customer. Projects can integrate this feature with their Medium, Steemit, RSS blog and Twitter channels so that all updates in these channels appear in a Delta user’s Delta Direct feed. Delta users can decide which projects to follow. 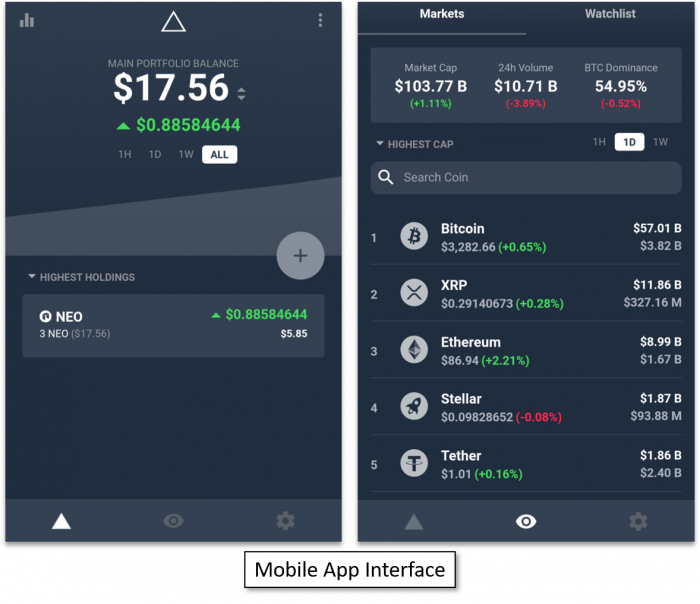 Our Take: Delta is a comprehensive no-nonsense portfolio tracking app which is suitable for low to medium-level traders because of its compact set of features for portfolio tracking. This is the only tracker with separate desktop clients. Exchange and wallet sync, wide-ranging crypto support, simple UI, multi-portfolio creation and Delta Direct are some of the notable features. 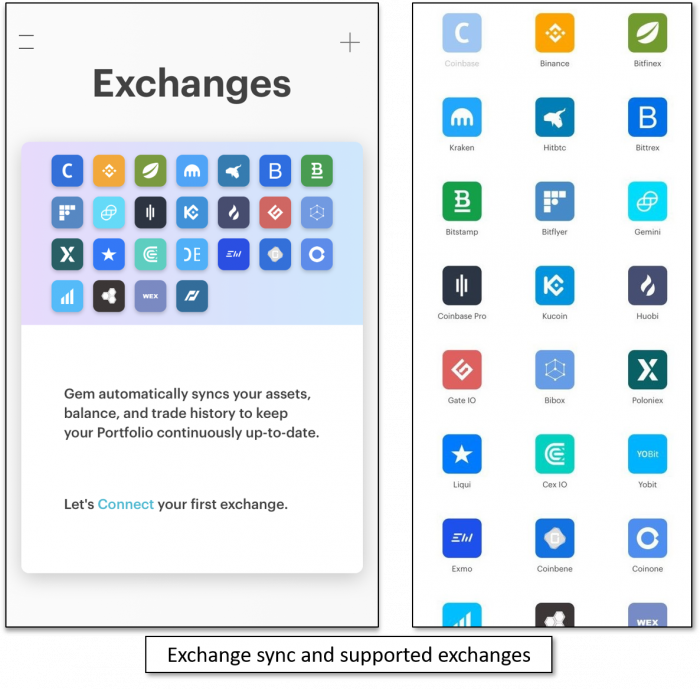 However, limited charting abilities, API sync support for few exchanges and free version being curtailed to only a couple of exchanges and/or wallets mar the experience a bit. This article is a repost of our recent Hackernoon article. 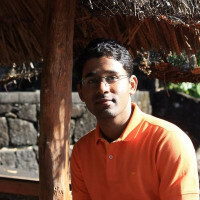 Rohit Chatterjee (https://www.publish0x.com/@falconite) is an Analog Design Engineer and Abhijoy Sarkar (https://www.publish0x.com/@abhijoysarkar) is a banker-turned-entrepreneur. They are high school friends who lost contact years ago. They reunited over crypto in early 2018 and have been investing through mutual research and shared knowledge.